Replaces battery power, LED indicator, 4 multi-plugs, 9-volt adapter and walk man plug. 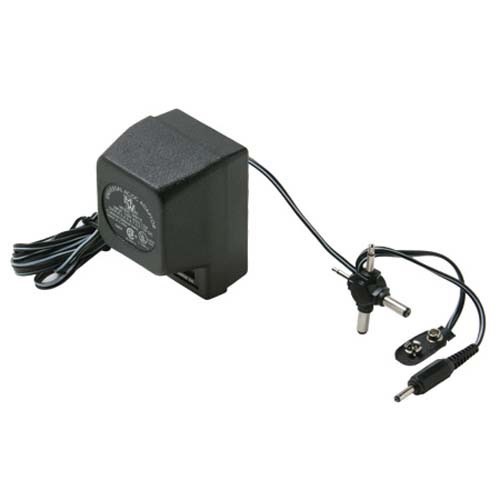 This Universal Power Adapter replaces those supplied with various types of equipment. The voltage is switchable for 3, 4.5, 6, 7.5, 9 and 12 volts. It has multi-plugs, a 9-volt battery clip plus a special plug for walk man type radios. Polarity switch for plus or minus. Set voltage selector switch to match the required voltage for your electronic equipment. Determine the polarity (+ or -) of the unit and set the selector switch to the correct setting. The polarity can be found on the unit or in the owner's manual. Select the proper adapter plug and plug into the DC input jack on equipment. Plug adapter into 110-120 electrical outlet.